We're always looking for people who want a part-time job beside their studies. Over 800 employees work at our stores for a few hours a week. Either on weekdays or weekends. It’s a nice bit of extra income for them. We’re also frequently looking for some additional help during the holiday season. Of course, our stores aren't the only places where there’s work to be done. We can often use a hand from students at our Distribution Center. "I was looking for a job on the weekends. I enjoy shopping at Zeeman, so I walked into one of the shops in my neighbourhood. I now work in the weekends and in the holiday season. I really enjoy talking with customers and helping them out. I'm never bored; there's always plenty to do. And we're a real team. Which just makes the work more fun." Even if you only work a few hours a week, you're an important part of the team. You do the same work as your colleagues who work more hours. It’s commercial work, and there’s a lot of variation. Find a job that’s right for you. Would you like to come and join our team? Have a look at our student jobs below. As a Sales assistant, you'll lend a hand in the store. 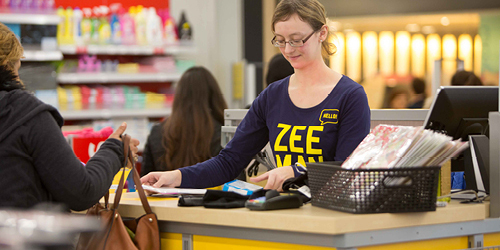 Looking for a job at Zeeman but haven’t found one that suits you? Then set up a Job Alert. We’ll keep you up to date on new openings. You can indicate what kind of job you're looking for. Once we’ve got a suitable vacancy, you'll receive an email. You can cancel your Job Alert at any time.